An on-call duty should be alarmed about incidents on an email servers, therefore cannot get an email from OTRS. Additionally, in the case where customers have no internet access, it’s imperative to ensure good contact. OTRS provides SMS as a cloud service and allows, as with email, management of this communication via templates. An SMS template is a default text which helps your agents to write faster tickets or answers. Use this screen to add SMS templates for use in communications. A fresh OTRS installation doesn’t contain any SMS templates by default. 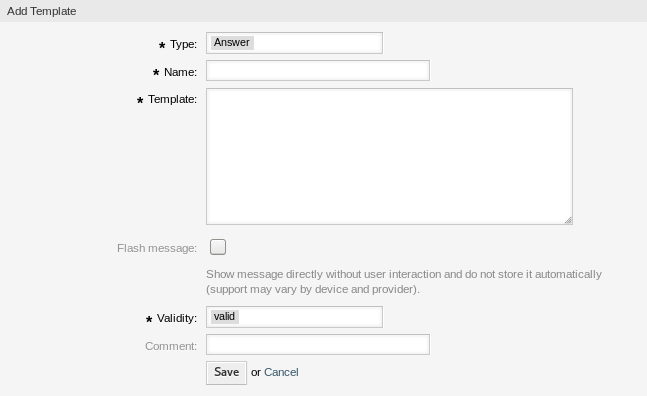 The SMS template management screen is available in the SMS Templates module of the Ticket Settings group. To be able to use SMS cloud service in OTRS, you have to activate it first in Cloud Services module. Click on the Add SMS Template button in the left sidebar. Click on an SMS template in the list of SMS templates. Click on the trash icon in the list of SMS templates. If several SMS templates are added to the system, a filter box is useful to find a particular SMS template by just typing to filter. To be used as a ticket response with Reply via SMS in the article menu of the ticket screen. To be used for a new SMS ticket. 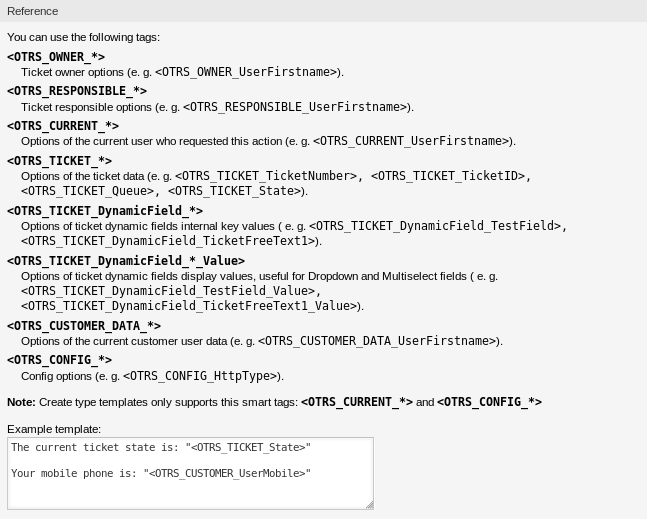 To be used for sending a new SMS to a customer user from within the ticket menu of the ticket screen. The maximum length of text message that you can send is 918 characters. However, if you send more than 160 characters then your message will be broken down in to chunks of 153 characters before being sent to the recipient’s handset. We recommend keeping the messages to less than 160 characters. Show message directly without user interaction and do not store it automatically (support may vary by device and provider). 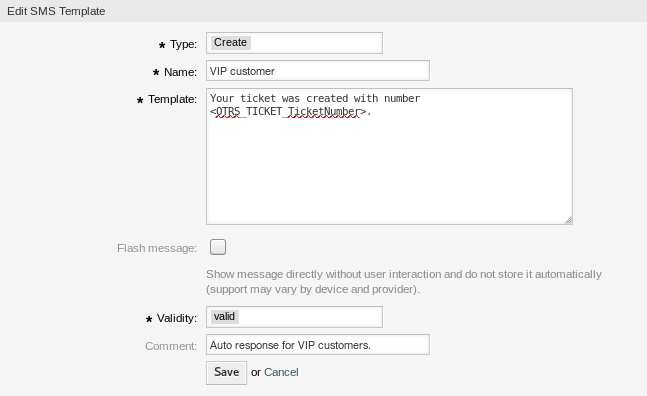 For example, the variable <OTRS_TICKET_TicketNumber> expands to the ticket number allowing an SMS template to include something like the following. Ticket#<OTRS_TICKET_TicketNumber> has been raised in <OTRS_Ticket_Queue>. Ticket#2018101042000012 has been raised in Postmaster.